On our July “Women Gathering 2018” weekend retreat we were led to reflect on the many different thresholds we have crossed in our life. Our one-day winter follow-up, on where each of us are with our life’s thresholds, was held January 19, 2019. This review made it clear to me all of life is about change and how I accept and grow with those changes. The challenging threshold I was standing on in July was to find my voice and express myself to a public political ideologue. I feared getting “dirty” in a fight. My initial fear of getting “dirty” led me to find the courage to write my truth respectfully, through a series of letters to the editor of my local paper. Main ideas in those letters were: we are all in this together—vote responsibly. Service to others is the hallmark of a healthy community. The health and education of our children is our country’s future. I shared recent tips I had learned in how to search the internet to be better informed on the issues and candidates on the ballot for my district. I acknowledged my gratitude for the Dane County League of Women Voters who listed statewide Wisconsin candidates and how each proposed to served the people if elected. I summarized the first ever Ozaukee County Democratic Party fundraiser where speakers called for respect and dignity of all; more equitable tax distribution, critical infrastructure maintenance, returning science to environmental management, investing in our children’s education, mental health, and adequate, affordable health care for all. And I quoted excerpts from Parker Palmer’s book, “Healing the Heart of Democracy: The Courage to Create a Politics Worthy of the Human Spirit”. I acknowledged we need grace in governance, and voting is more than a civic duty, it is a spiritual exercise. And finally, I shared how learning to breathe from my heart allows me to feel sheer compassion for those who govern with self-serving agendas. I was in a better place for our “Women Gathering” January Thresholds’ review. I realized how much effort I put into reflecting/writing/speaking my truth. Not just in political matters, but also from my own life in the completion of my second memoire titled, “Both and Things – The Power in Reflection”. 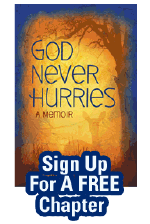 In my first memoire, “God Never Hurries”, I danced with anger and fear for my mother’s and my safety. In “Both and Things” I am learning to dance with love, forgiveness and connection. 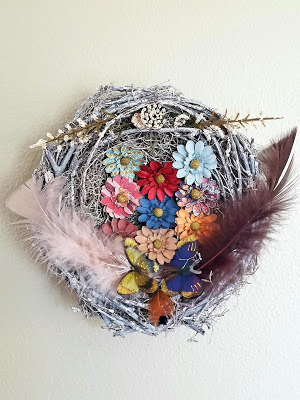 The nest photo in this post was an art therapy piece from July’s “Women Gathering” weekend retreat. When “Both and Things – The Power in Reflection” is printed, the nest photo will become the book's cover and will include an explanation of its symbolism for me. is going to happen to you. What if we all felt empowered through reflection?